I saw this on Dinner with Julie and I’ve already made it a couple of times (it helps that I have an abundance of both main ingredients in my garden!). I use my regular Brown Sugar Pastry, but for ‘galette-styled’ pies (meaning super fast pies), I divide the dough into 4 portions instead of 5. 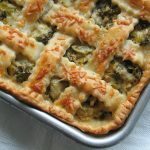 One fourth makes a perfect galette pie, two fifths make a perfect 2-crust pie…hope that makes sense – enjoy! Preheat the oven to 450 and then roll out your pastry as you would into an extra-large circle (for me this means about 15 inches). 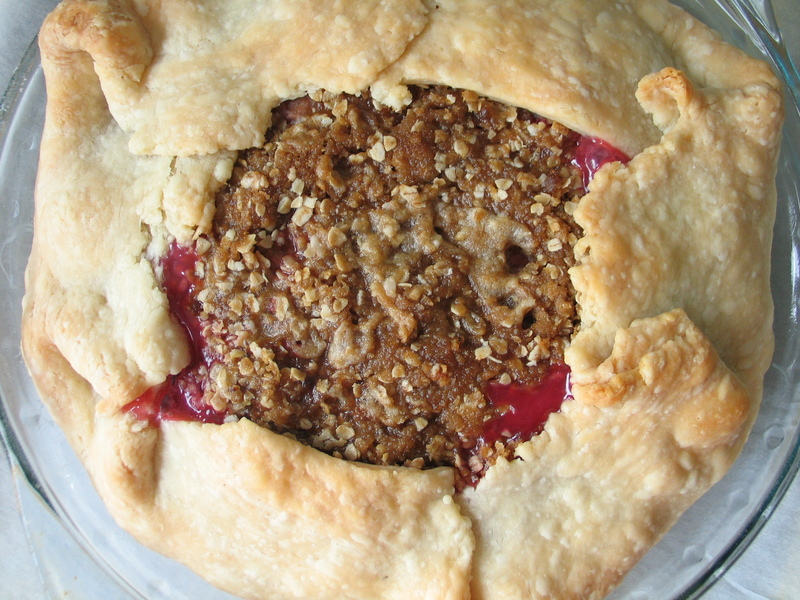 In a large bowl, gently combine the rhubarb, raspberries, sugar and cornstarch, and in a second smaller bowl, use a pastry cutter to work together the crumble ingredients. Lay the crust out over your pie plate – I always use a 9 1/2-inch Pyrex – and gently press it in so it stays put, then give the filling another mix and scrape it all into the crust. Layer on the crumble, with more going to the center, then fold up the hanging pastry over the edges. Bake for 10 minutes at 450, then reduce the heat to 350 and put on your ‘edge-protector’. Bake for 45 minutes at 350, then lay a piece of foil over the whole pie and bake for another 15 minutes – you can also omit the foil if you like your crumble darker, but keep an eye on the crust. Allow the pie to cool enough so that it’s safe to eat and then enjoy!